(Beyond Pesticides, June 23, 2015) After years of denial and obstruction, Air Force and Air Force Reserve veterans now have the chance to receive compensation for their exposure to the highly toxic herbicide Agent Orange on contaminated aircraft used after the Vietnam War. 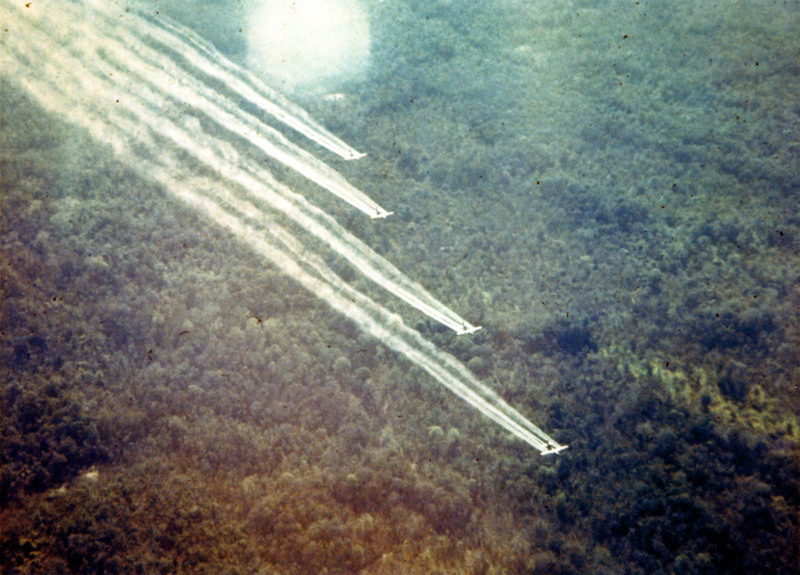 Affected veteran’s health issues stem from their time spent on UC-123 transport planes, which during the war were outfitted with spray equipment in the American military’s attempt to eliminate forest cover for Vietcong fighters. After the war, these aircraft were returned to use in the United States for basic transport operations such as cargo shipping and medical evacuation missions. However, these planes never underwent any form of decontamination or testing before being repurposed. Past studies have found that U.S. war veterans exposed to Agent Orange developed chronic lymphocytic leukemia, Hodgkin’s disease and non-Hodgkins lymphoma, prostate cancer, Parkinson’s disease, and diabetes. Many children of exposed veterans have been affected by their parents’ exposure to the chemical and show a wide range of symptoms. Agent Orange was given its name because it was stored in orange striped drums and contained the active ingredients 2,4-D and 2,4,5-T. This formulation was contaminated with the highly toxic 2,3,7,8-tetrachlorodibenzo-p-dioxin (also called TCDD or simply dioxin) and is now banned. However, 2,4-D is still one of the most widely used herbicides on lawns, school grounds and parks today. It has been linked to cancer, liver damage and endocrine disruption in humans in addition to being toxic to wildlife, pets and beneficial insects. Moreover, previous research from the U.S. Environmental Protection Agency did detect dioxin contamination in a number of 2,4-D herbicide products. The possibility of continuing contamination of 2,4-D herbicides with dioxin is particularly concerning as EPA and USDA recently gave the green light for Dow Chemical to grow crops genetically engineered to withstand repeated applications of 2,4-D. The approval of this toxic system was granted in response to widespread weed resistance to glyphosate-tolerant GE crops. And as with glyphosate-resistant crops, a massive increase in 2,4-D use can be expected to occur as a result of this approval. A coalition of conservation, food safety, and public health groups including Beyond Pesticides continue to challenge this decision in the courts. For more information about the legacy of Agent Orange, see previous Daily News stories on the issue, or view the Pesticide Induced Diseases Database. For more information about why we should take a precautionary approach to GE agriculture, see Beyond Pesticides’ GE webpage. This entry was posted on Tuesday, June 23rd, 2015 at 12:01 am	and is filed under 2,4-D, Announcements, Cancer, Chemicals, Contamination, Corporations, Diabetes, Disease/Health Effects, Dow Chemical, Genetic Engineering, Glyphosate, Lymphoma, non-Hodgkin's Lymphoma, Parkinson's. You can follow any responses to this entry through the RSS 2.0 feed. You can skip to the end and leave a response. Pinging is currently not allowed.